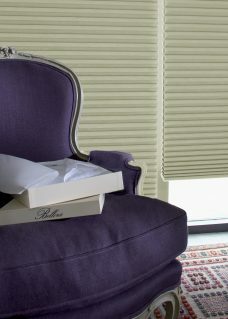 As a matter of fact, Duette Blinds 32 mm are built using with cellular pleats. The fabrics consist of a soft honeycomb material. Because energy prices continue to rise, the construction of Duette Blinds reduce energy costs. 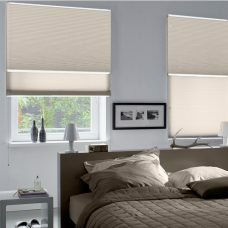 Consequently, the blind works like an insulating blanket trapping air within the honeycomb material. 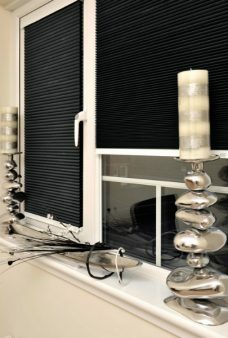 In comparison to regular pleated blinds , cords are not visible. In fact, cords run down the centre of the blind. Batiste – A semi-transparent material. The main colour is room facing, while the other side has a white backing. 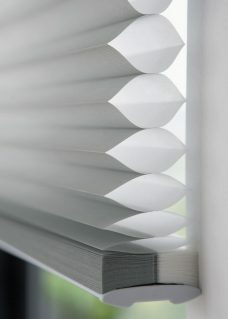 Blackout Duette Honeycomb blinds- An aluminium coating inside the honeycomb. Duo Tone – Two tone fabric. Main colour plus a white colour. Full Tone Fabric-The same colour on both sides of the fabric. A choice of operation, either LiteRise or SmartCord. An important point to bear in mind, SmartCord are suitable on very long windows. By the same token, for very long windows, it may be worth selecting the SmartCord option as you may not be tall enough to reach the top of the window. Both are considered safe by design by the Blinds industry. NB Photos provide an idea how the Duette 32 mm can look. To check properties, order a sample.